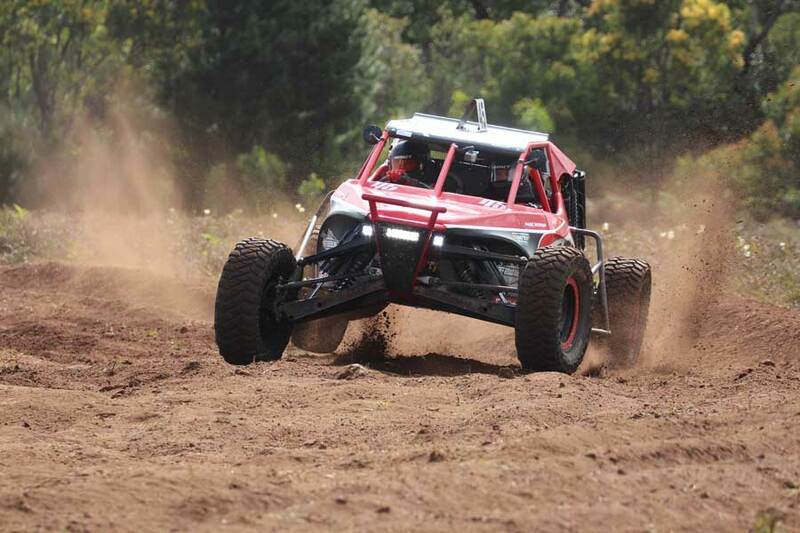 Mother Nature turned on near perfect racing conditions at Millicent in the South Australian South East for the final round of the 2018 ARB Australian Off Road Racing Championship, the Teagle Excavations ARB Pines Enduro 400. 54 teams ultimately met the start lights with previous Pines winner Matt Hanson with Nigel Pendlebury in the navigators seat topping the time sheets after their qualifying run. Sitting in second place on the prologue podium and just 0.143seconds behind Hanson was round 5 second placegetters Andy Brown and Mark Sedran #45. Round 5 at Goondiwindi victors Danny Brown and George Apted #1 slotted into third place after the prologue in the second ever run for the #1 Alumi Craft on Australian soil. 2017 Teagle Excavations ARB Pines Enduro 400 winners cousins Tyler Owen and Oliver Stephens #41 are in good form finishing in fourth place ahead of Waikerie round 3 winners Greg Gartner and Jamie Jennings #410. The prologue was not without incident with Dean Carter and Bradley Jacobs #281 having clutch issues in the line up grid and returning to the pits. Jason Forssman and Del Palmer #774, who are fighting for class points and the right to don the #701 plate for 2019, suffered from a broken front differential housing during the prologue and are frantically spending the afternoon/evening in the pits trying to fix the Nissan Patrol to keep their Championship hopes alive. Bryan Jones and Prudee Leffler lost a rear wheel over the arena jump, lucky not to sustain more damage and have managed to repair the #168 Striker ready for Sundays race start. Heading into the final round Championship points leaders Brent Martin and Jimmy Boyle had the #1 plate in an unbeatable position and were looking for a stress free enjoyable weekend of racing through the pine forests. Unfortunately, the brakes stuck on during the prologue sending the #120 Jimco to the pits. The Martin Motorsport team fixed the brake issue and Brent met the start line for his short course heat. Mid way through his first lap the call came over the radio that #120 was in the hands of recovery with gearbox dramas. Unfortunately, for Brent and Jimmy, the problem was not fixable and the championship winning Jimco is tucked in for the rest of the weekend in the transporter. 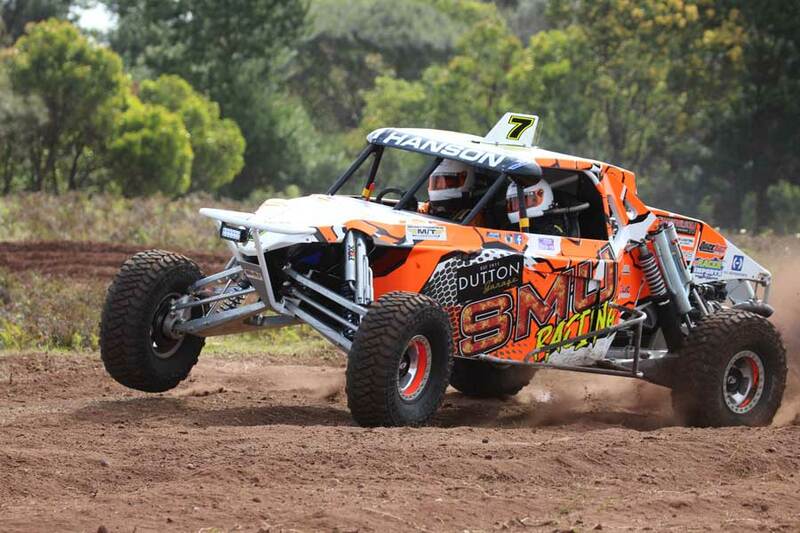 While on the subject of the ARB Australian Off Road Racing Championship, Bernie Clohesy #570, who currently sits in second place on 264 points ahead of Paul Grant #405 on 233 points, suffered an unknown electrical issue while on the line up grid for his short course heat. After a frantic effort of fiddling with wires and switches the #570 Mitsubishi Triton fired into life and made the start line with just few seconds to spare. With the Championship mantle already decided, second and third place are well and truly open and up for the taking. The four rounds to count will definitely come into play with all teams keeping a keen eye on who is placing where. The four lap short course heats were filled with wheel to wheel racing much to the delight of the 5,000 plus crowd that had made the most of the fine weather to come out and witness the spectacle of off road racing. Matt Hanson maintained his position at the top of the tree with Greg Gartner in second place, Mark Burrows in third, Tyler Owen in fourth and Andy Brown rounding out the short course top five. 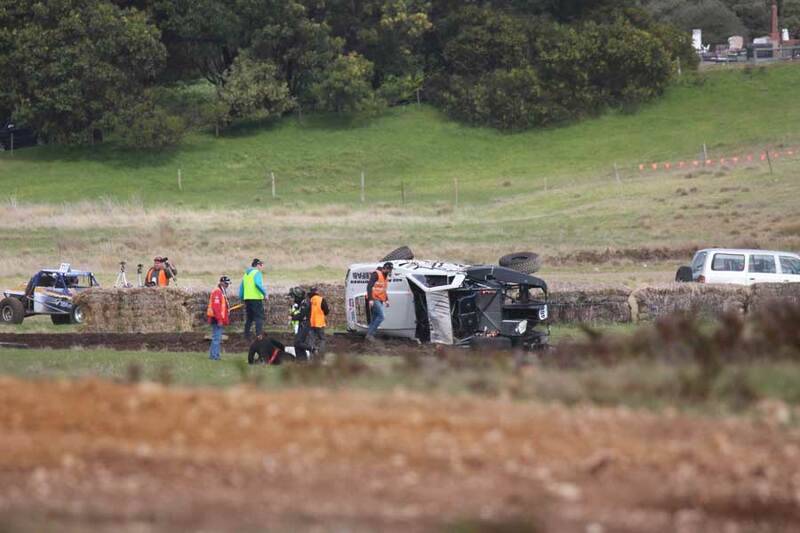 The arena jump caught Simon Leech and Craig Bourne by surprise in the debut run of the ex Mark Lacey Micklefab Raptor #408; after taking possession just 2 weeks ago, Leech launched off the jump, rolling with massive air, coming to rest on its side. Both crew walked away with a dent in their pride, but will live to race another day. Dale Standen and Josh Lyell #292 have ended their weekend of racing with engine failure in the Hunter Rivmasta while Connor Smith and Adam Jeffery #415 are hopeful of fixing their ongoing electrical issue to be on the start line for Sunday’s 6 laps. After travelling from Tasmania to race through the pine forests, Chris (Tiny) Boon lost a wheel during his short course race and is busy trying to source parts to fix the Frontline Motorsport TinyBuilt #1091 and go racing tomorrow. The start order for Sunday’s race proper is based on a competitor’s fastest lap from either today’s prologue or short course laps. Therefore, the start order doesn’t always resemble the outright times order. Throw in a reverse grid format and start intervals of 80 seconds with two cars at a time, and the scene is set for some spectacular racing through Teagle’s Quarry and the Tantanoola Pine Forests. 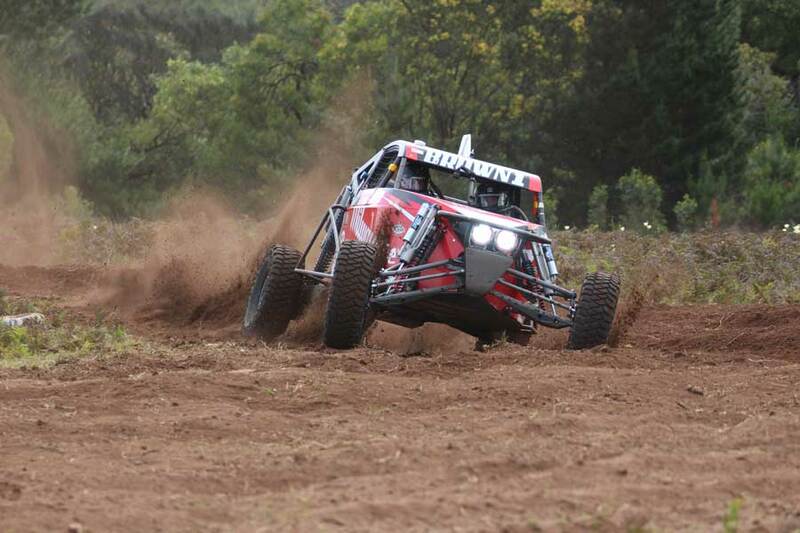 Stay up to date with live results and live streaming of the track PA on offroadracing.com.au. Vision from the event will also be live streamed on the Teagle Excavations ARB Pines Enduro FaceBook page.